Warm water underfloor heating (UFH) in a suspended timber floor offers all the benefits associated with this form of heating without adding height to the overall floor construction, making it a popular solution. We talk to Heather Oliver, Development Manager at Nu-Heat, for some tips on where it can be used and how to install it effectively. There’s no doubt that underfloor heating is an established space heating method, delivering comfortable and cost-effective warmth. That said, a proportion of the thousands of domestic installations carried out each year are to the ground floor of properties only, since installing upstairs (particularly in retrofit situations) has been seen by some heating engineers and underfloor heating companies as more problematic. However, there are solutions for suspended timber floors that incorporate a metal heat transfer plate designed specifically to act as a thermal conductor, improving both response times and ease of installation. Flexibility is the key – a UFH floor construction that can be fitted over first-floor joists from above before the deck is laid or between the joists from below after the deck is laid is ideal in terms of installation, as it allows installers to work on site without affecting the build schedule of the other trades. Where the heat transfer plates have been fitted over the top of the joists, the heating tube can still be fitted from below if it is more convenient, which is a bonus in terms of health and safety as there will be no balancing on joists to install pipework. The plate is compatible with most types of joists: traditional timber, TJI/I-beam and steel braced systems (Eco-joists, Posi-joists, etc). Retrofitting this floor construction into the first floor of an existing property can also be straightforward if the homeowner is happy for either the existing floorboards to be taken up or the ceiling below to be removed. If this is not the case there are other floor constructions that may be more suitable, so it is always best to check with your UFH supplier before making any recommendations. First-floor rooms typically require less heating than ground floor living areas, partly because they are likely to be over a heated space, meaning a UFH solution is often suitable for retrofit projects. 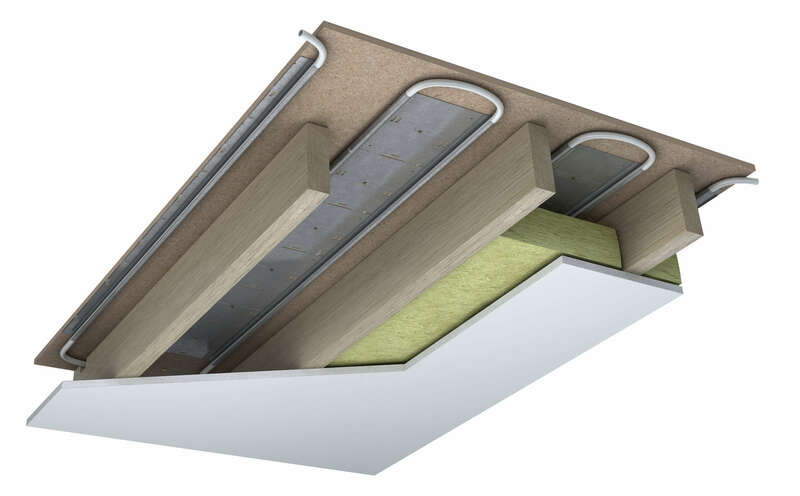 A solution that uses heat transfer plates can be used on suspended ground floors where there is sufficient insulation present – not a problem in a new-build, which will have been built to meet building regulations, but something that needs consideration in a retrofit scenario. If the insulation needs to be upgraded, mineral wool in a bag can easily be clipped to the sides of the joists, standard mineral wool can be laid on top of netting or solid insulation panels can be cut to fit and wedged/fixed in place between the joists. Obviously, any heating system has to produce sufficient heat output to warm the building effectively, so a system that incorporates metal heat transfer plates has a built-in advantage, as they will heat up relatively quickly and on/off times can be programmed in a similar way to a radiator system. For flats, apartments and communal buildings this construction is also available as part of an acoustic floor cassette that incorporates a gypsum panel as part of the floor deck and meets pre-completion testing criteria, so again it is well worth checking that your supplier can offer this. The alternative option is one that installs the plate over an acoustic batten fitted to the top of the floor deck; this is fine for situations where the level of the deck can be raised. If solid joists are present either follow the building regulation rules on notching to allow the UFH tube to pass between joist bays or alternatively, fit a 15mm batten to the bottom of the joist leaving a gap for the tube to pass through. It is quickest to work in pairs – one person lays the plate and the other follows behind with a drill fixing it to the joists with screws. Once the plates are securely in place (either on top of or between the joists) the floor-heating tube can be fitted – one person holds the tube and another clips it into place. Because the plate is metal and slightly pliable the tube can be easily pushed into position, so it should be possible to fit a 20m2 room in just 30 minutes. Organise the installation like an assembly line so that while one person push-fits the tube in place, the other can prepare the next room – this will allow you to maintain momentum throughout the job. Most importantly, a plated UFH system is likely to be cheaper to purchase than other joisted floor solutions and is quick to install, meaning your customers will get an effective heating system that is affordable to buy, install and run.